Folks typically have a ton of questions on bicycle commute – safety, pollution, feasibility, sweat, kind of bike etc. Bicycle commute is very important to us at BumsOnTheSaddle – we believe that it is the best way to move around in an urban setup. Plus its loads of fun! 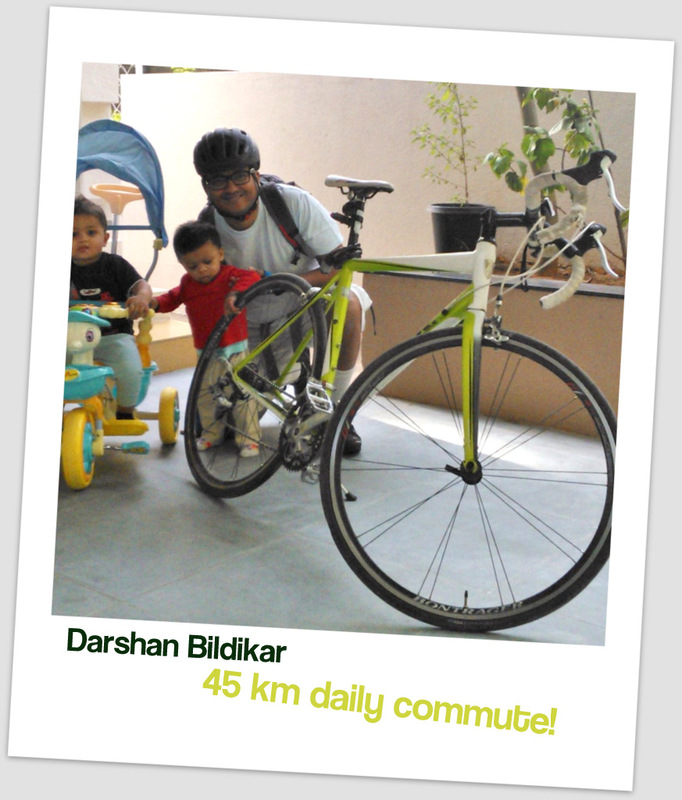 Darshan recently dropped into BumsOnTheSaddle and was talking to us about his 45km daily commute! And we had to share it with the rest of the world! I recently visited BumsOnTheSaddle a.k.a BOTS to get the folks there to fix a niggle on my Trek 1.5. When I mentioned to Rohan that I commute 45 KM daily to office he said that I should probably do a small write up about it. If this inspires someone else to get their bum on the saddle, great! About a year ago, one of my friends bought a Trek 3700 from BOTS. It looked damn cool and like most guys, his shiny new toy impressed me, for that’s all I considered it at that point of time. 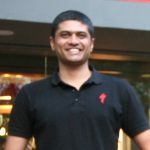 I work in the IT industry and had been leading a mostly sedentary lifestyle with absolutely no exercise and an aversion to gyms (still hate them). A cycle seemed like a great option at that time to get a little bit of exercise. I wasn’t even thinking of commuting to office at that point of time. So I bought my Trek 3700 from BOTS. I stay in the south of Bangalore near Bannergatta National park and I still remember the first ride we did to Ragihalli forest. I willnever forget those excruciating 12 KM. Within 15 days though it got easier and I was doing 18 KM rides almost everyday. And then one day, I guess I had a kind-of-epiphany; I realized that if I was riding 18 KM everyday, there was nothing stopping me riding the 15 KM to my office at least 2 days a week. I started to and that’s when I realized how fantastically convenient it was to commute to office by cycle. For one, it is much, much faster than a car and this is something that people don’t realize or don’t believe when I tell them. When I drove to office it used to take me about an hour in semi-peak traffic (7:45 in the morning). When I started cycling, it initially took me about 50 minutes to reach office. Within about two months, I was able to bring this down to 35 mins if I pushed hard and 40 mins if I didn’t. Soon I was commuting all 5 days to office by cycle a distance of 32 KM daily. It was great and I loved it! I was getting fitter,losing weight and having so much fun! Then I changed companies and my new company was 23 KM away from home. Basically the other end of town. There’s no way I can do thins on a cycle I thought. I was wrong. Again, I started with baby steps. I was thinking let me do this at least once a week. It took me about an hour and 15 minutes to get to Yeshwantpur from Begur Road where I live. Though I wasn’t really tired at the end of it that was more time than I was willing to spend on the road. That’s when the same friend who initially bought the Trek 3700 suggested that I try a road bike. I researched it and bought a second hand Trek 1.5 that hadn’t run much. 1) My office is too far, commuting by cycle will just take too much time: I think I’ve answered that. No it won’t take too much time. It will save you time. The caveat here is that you have to invest in a goodcycle. I see no reason for you not to! If you can spend 5L on a car, then you can certainly spend 20K on a good cycle when it’s basically serving the same purpose. Getting you from point A to point B. Not to mention the great savings on fuel! 2) Am I fit enough: I’d been leading a sedentary lifestyle myself for two years before I took to cycling. Also, I have no shame in admitting now that I was 12 KG overweight and very far from being fit. If I can, you can. Needless to say that cycling will help you get fitter. A lot fitter! 3) Won’t you reach office tired? No you won’t. In fact the days that I don’t cycle are the days that I feel most lethargic on. 4) Won’t I reach office all sweaty: Yes you will. If you’re lucky to work someplace that has a gym or a shower room, problem solved. Else, just carry a change of clothes and freshen up in the washroom. 5) What about my laptop: I’ve been carrying a change of clothes and a laptop over the past year. No back problems. Just get a nice enough bag. 6) What about the pollution: What can I say? It’s about as bad as riding a motorcycle and if you leave early enough you don’t breathe in that much smoke. Also, it’s going to take folks to start using public transport and cycling as a means of commuting to get the level of pollution down. So you’re doing your bit. 7) Is it safe: Yes it is safe. About as safe as any other mode of transport you use in this city. All you need is a healthy dose of common sense. Everywhere I ride people are stopping me to ask me questions or generally to wave and smile. Let’s just face it; I’m one of the coolest things on the road J. Won’t you join me? Thanks a ton for sharing that will all our bikers Darshan!